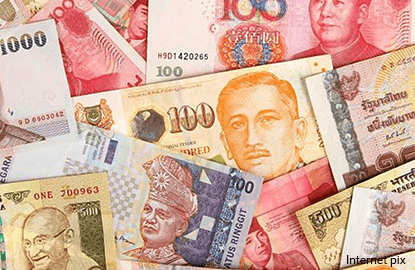 SINGAPORE (Feb 14): Asian currencies rose on Tuesday as the resignation of US President Donald Trump's national security adviser dented the US dollar, with the South Korean won getting an additional lift as local exporters sold the greenback. The won outperformed its regional peers and closed onshore trade at 1137.4 per US dollar, rising 1.2% on the day. The won's sharp gains came as local exporters stepped up their US dollar-selling. Some Seoul-based dealers said US dollar-selling by offshore funds added to the momentum. Most other Asian currencies also gained ground. The Taiwan dollar touched a high of 30.745 per US dollar, its strongest level since June 2015. After paring some gains, the Taiwan dollar was up 0.6% at 30.835. The Singapore dollar edged up 0.4%, while the Thai baht rose 0.3%. The gains in Asian currencies came as the greenback came under pressure following news that Trump's national security adviser, Michael Flynn, resigned late on Monday. Flynn's resignation came after revelations that he had discussed US sanctions on Russia with the Russian ambassador to the United States before Trump took office and misled Vice President Mike Pence about the conversations. Andy Ji, Asian currency strategist for Commonwealth Bank of Australia, said the news could reinforce doubts over whether Trump can carry out all the policies he has promised to implement, including reflationary economic policies. "Those are the basis for (US) dollar strength since his election win. The market is starting to scale back a lot of expectations on that front," Ji said. "It's sort of a double whammy because every time people have doubts over... upcoming economic policies, people scale back on expectations in terms of the Fed's policy as well," he said, referring to market expectations for further rises in US interest rates. Traders were also awaiting US Federal Reserve Chair Janet Yellen's testimony to Congress on Tuesday and Wednesday. Some market participants are likely to reduce their positions ahead of Yellen's testimony later on Tuesday, said a trader for a Malaysian bank in Kuala Lumpur.